Without significant reductions of greenhouse gas emissions, climate change will cause substantial damage to the environment and the economy. The scope of the threat demands a close look at the policies capable of reducing the harm. 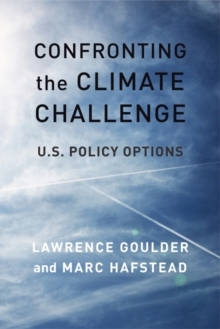 Confronting the Climate Challenge presents a unique framework for evaluating the impacts of a range of U.S. climate-policy options, both for the economy overall and for particular household groups, industries, and regions. 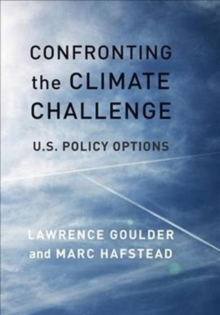 Lawrence Goulder and Marc Hafstead focus on four alternative approaches for reducing carbon dioxide emissions: a revenue-neutral carbon tax, a cap-and-trade program, a clean energy standard, and an increase in the federal gasoline tax. They demonstrate that these policies-if designed correctly-not only can achieve emissions reductions at low cost but also can avoid placing undesirable burdens on low-income household groups or especially vulnerable industries. Goulder and Hafstead apply a multiperiod, economy-wide general equilibrium model that is distinct in its attention to investment dynamics and to interactions between climate policy and the tax system. Exploiting the unique features of the model, they contrast the shorter- and longer-term policy impacts and focus on alternative ways of feeding back-or "recycling"-policy-generated revenues to the private sector. Their work shows how careful policy design, including the judicious use of policy-generated revenues, can achieve desired reductions in carbon dioxide emissions at low cost, avoid uneven impacts across household income groups, and prevent losses of profit in the most vulnerable U.S. industries. Despite dim prospects for climate policy in the federal government, the urgency of the crisis demands comprehensive action, and Confronting the Climate Challenge offers a theoretically and empirically sound framework for doing so.